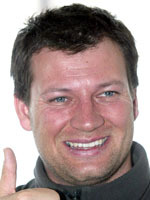 After a 25-year skiing career, Austrian Stephan Eberharter stepped down from the circuit in September, 2004 with nearly every major title under his belt. He can bow out with enormous pride having won seven World Cup globes including the overall title in 2002 and 2003 and he even finished second overall in 2004 to signal his departure whilst he was still at the top. At his last Olympiad in 2002 at Salt Lake, he left with gold in the giant slalom and bronze in the downhill although doubters will say that his fantastic season was achieved thanks to the absence of Hermann Maier, whose season ended after a motorcycle accident. An Olympic title had eluded him in the super-G as Norwegian Kjetil Andre Aamodt edged him home by a slender margin, so his final triumph was all the more sweet. The following month he won the super-G World Cup title in his home resort of Altenmarkt. His career got off to a cracking start: in 1991 nothing could go wrong for the Austrian as he romped to victory in combined and super-G races in irresistible fashion. However, his body suffered between the end of the 1992 Olympics at Albertville and the Austrian championships in 1996 when he was injured no less than five times, hence the huge gap in his curriculum vitae. His disappointing performance at the world championships at Sierra Nevada in 1996 led to him being relegated to the European Cup circuit, but after working hard he was back in the elite circuit in time for the 1997-98 season. There he met Maier, whose reign on the slopes was just reaching maturity. But instead of bowing to the strength of his force field, Eberharter seemed to take energy from it. In 2001, the two men fought tooth and nail right up to the last race in the World Cup series before Maier finally triumphed. In February, 2003 Eberharter won the super-G world championship gold 12 years after his initial victory in the same race and followed up by clinching his second straight World Cup title holding off American Bode Miller in a duel that went to the last weekend of the season. In his final season in 2004, Eberharter could still mix it with the best but Maier was now back and capped his comeback season with the overall World Cup title, leaving his compatriot to quit the circuit with second place.